Achieve perfect skin all over with the miracle body complexion sponge. This sponge can be used for streak-free application of highlighters, bronzers, and body makeup. The larger size is designed to cover the curves of your body. Use the flat edge for contouring and highlighting, and the tip for precision application. Designed to fit your body's curves and contours with flawless perfection. 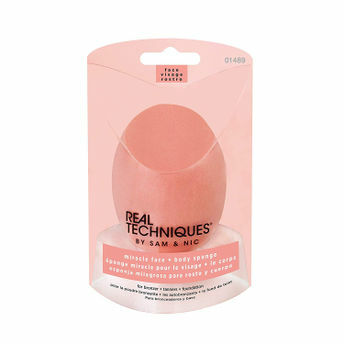 This versatile sponge can be used dry for fuller coverage or damp for a sheer, dewy glow. Ideal for highlighters, bronzers, and body makeup. Designed to fit your body curves and contours.